Smart textiles are materials and structures that sense and react to environmental conditions or stimuli, and their integration into protective clothing has led to the development of products with greatly enhanced protective capabilities in hazardous situations. 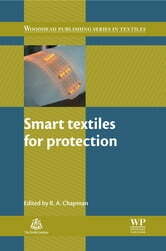 Smart textiles for protection provides a comprehensive analysis of smart materials used in producing protective textiles, and explores a wide range of end-use protective applications. Part one reviews smart materials and technologies. Beginning with an overview of smart textiles for protection, this section goes on to discuss types of materials, surface treatments and the use of nanofibres and smart barrier membranes. The application of sensors, actuators and computer systems in smart protective textiles is explored, followed by a review of biomimetic approaches to design. Part two investigates specific applications of smart textiles for protection. Smart technology for personal protective equipment and clothing, smart protective textiles for older people and smart high-performance textiles for protection in construction and geotechnical applications are all discussed in depth, as is the use of smart textiles in the protection of armoured vehicles and in protective clothing for fire fighters and first responders. The final chapter describes recent advances in chemical and biological protective clothing. 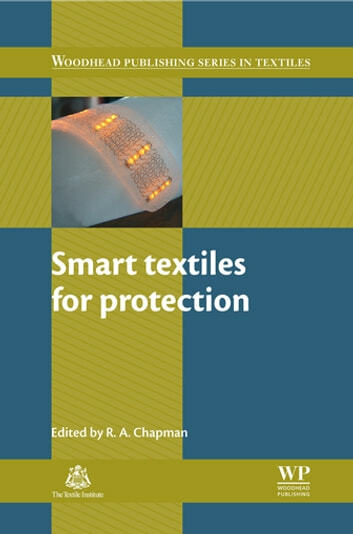 With its distinguished editor and international team of expert contributors, Smart textiles for protection is an essential guide for all those involved in the design, development and application of protective smart textiles.